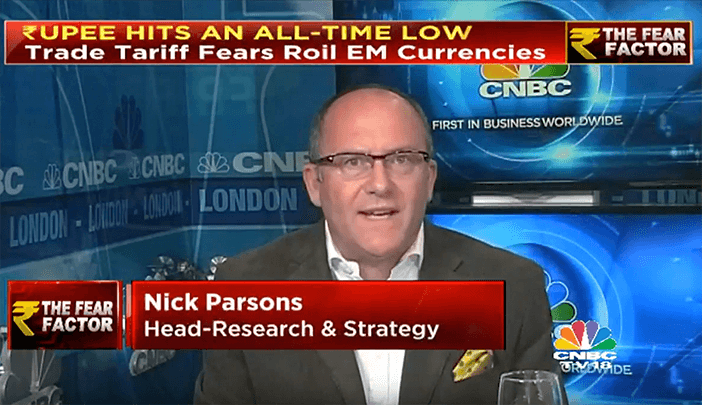 Home › CNBC TV 18 India: Nick Parsons discusses the situation of the Emerging Market Currencies and the Indian Rupee. In a special programme on Emerging Market Currencies and the Indian Rupee, ThomasLloyd Head of Research & Strategy Nick Parsons discusses with Ms Latha Venkatesh the recent sell-off in EMFX. He notes that macroeconomic fundamentals remain strong in India, which is now the world’s 6th largest economy. He says the Indian Rupee has been caught in a wave of indiscriminate selling across EM but that forward exchange rates offer significant protection given that government bonds now yield more than 8 per cent.